Fox News is already spreading misinformation about newly announced Democratic presidential candidate Beto O’Rourke. This claim originated from a midterm election debate between Sen. Ted Cruz (R-TX) and O’Rourke in September, during which Cruz said: “Just this week, Congressman O’Rourke described law enforcement -- described police officers -- as modern-day Jim Crow.” Following that debate, multiple news organizations explained that Cruz was misleadingly simplifying comments O’Rourke made about racial discrimination that is found throughout the entire criminal justice system as well as in legislative redistricting. America’s Newsroom was not the first Fox show to recycle Cruz’s debunked claim against O’Rourke as an objective fact. Last night on The Story, before O’Rourke officially announced his candidacy, Fox contributor Karl Rove stated that O’Rourke had said “law enforcement is the new Jim Crowism.” Rove repeated this claim on Fox Business’ Mornings with Maria Bartiromo today. And Fox & Friends co-host Ainsley Earhardt said this morning that O’Rourke “called law enforcement ‘the new Jim Crow,’” not just once, not twice, but three times. Fox News has been pushing the claim that its “hard news” division is separate from its opinion shows and commentators. But this example of a Fox anchor dutifully repeating a false talking point about O’Rourke -- one that had already been repeatedly pushed by a Fox & Friends co-host and President George W. Bush’s former deputy chief of staff -- is just further evidence that no such editorial divide exists at Fox. More than a dozen Fox hosts and contributors have been raising funds for Republican Party organizations around the country since Donald Trump was elected president, according to a Media Matters review. 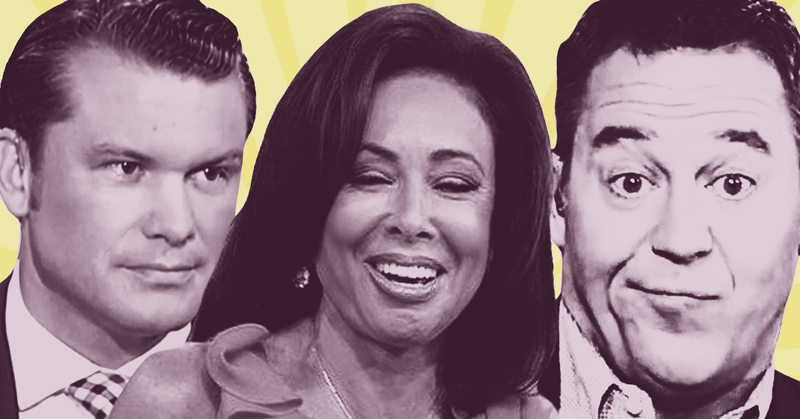 Fox hosts and contributors have been some of President Trump’s loudest supporters, using the network to push his agenda and attack his critics. Trump, in turn, has rewarded the network with regular interviews and praise. While Fox personalities’ on-air support for Trump and his party is open and well-documented, many of those same hosts and contributors have also been working off-air to raise critical funds for state and local GOP organizations. In addition to aligning themselves with Trump, those organizations provide backing and resources to Republican candidates when they run for office. 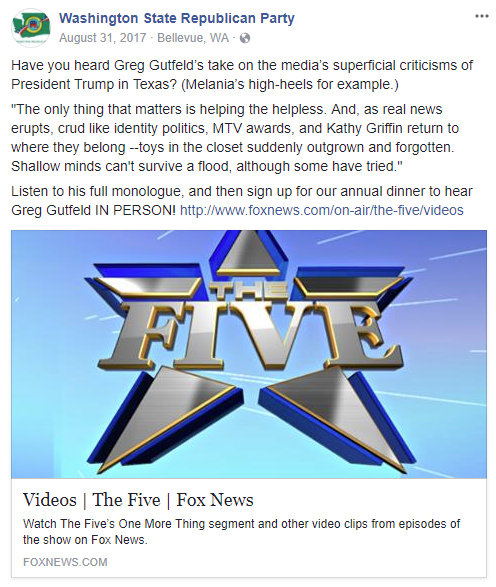 The Fox personalities include hosts Lou Dobbs (​Fox Business' Lou Dobbs Tonight), Greg Gutfeld (Fox News' The Five and The Greg Gutfeld Show), Pete Hegseth (Fox News' Fox & Friends Weekend), and Jeanine Pirro (Justice with Judge Jeanine), and Fox News contributors John Bolton, David Bossie, Rachel Campos-Duffy, Jason Chaffetz, Sebastian Gorka, Mike Huckabee, Alveda King, Ed Rollins, Karl Rove, and Allen West. Fox News host Laura Ingraham also headlined an October fundraiser for Republican Arizona U.S. Senate candidate Kelli Ward. The New York Times reported at the time that “Fox News hosts are not usually allowed to stump for candidates, but Ms. Ingraham was granted an exception because her show had not yet begun” (Ingraham was a Fox News contributor and frequent guest host prior to starting The Ingraham Angle). 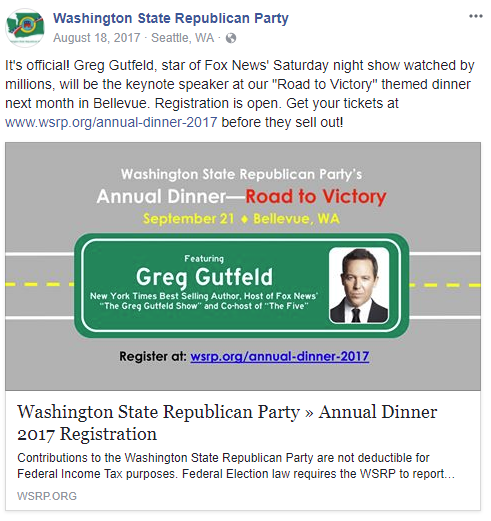 But Fox's reported prohibition against hosts stumping for candidates is meaningless given that they're allowed to raise funds for political parties that help those very same candidates. Keynoting fundraisers can be potentially lucrative for media personalities, according to available campaign finance data. 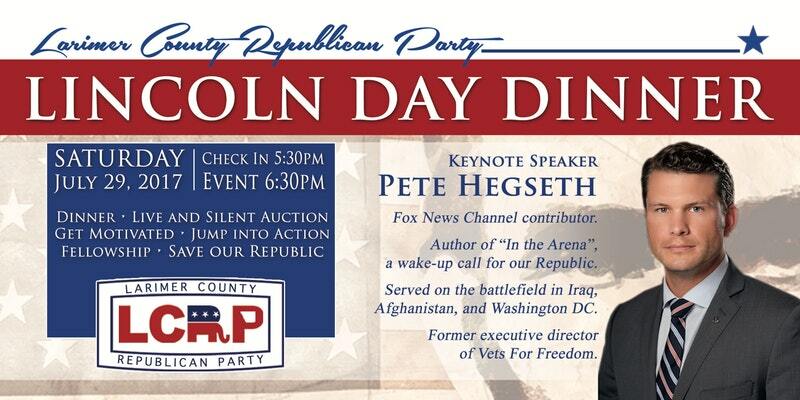 The Larimer County Republican Party in Colorado paid Premiere Speakers Bureau, which represents Pete Hegseth, a total of $5,000 in speaking fees around the time of the event Hegseth was headlining. Jeanine Pirro has received fees ranging from roughly $5,000 to $20,000 from state and local branches of the GOP. 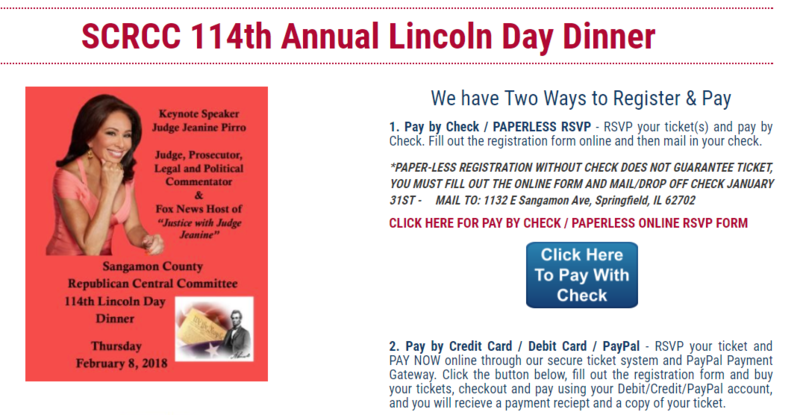 The Manatee County GOP paid a $25,000 “fee” to Washington Speakers Bureau, which exclusively represents Dobbs, a few months before its event with the pro-Trump host. It also paid roughly $2,300 for travel expenses to the bureau shortly after the event. 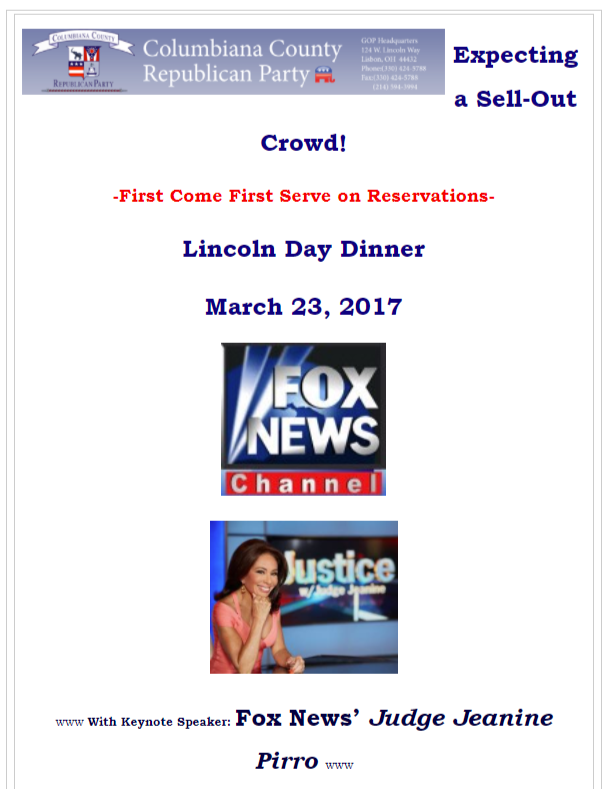 A common theme among the Republican fundraisers is the use of Fox News’ branding and notoriety to sell tickets. The following is a non-comprehensive list of Fox News personalities who have headlined or have been scheduled to headline 2017-2018 fundraisers for Republican Party organizations. Flagler County Republican Party (FL); San Francisco Republican Party (CA);​ Smith County Republican Club (TX). Republican Central Committee of Harford County (MD); St. Mary's County Republican Central Committee (MD); Washington County Republican Central Committee (MD); Wicomico County Republican Central Committee and the Salisbury University College Republicans (MD). Republican Party of Wood County (WI). Gallatin and Madison County Republican Central Committees (MT). Manatee County Republican Executive Committee (FL). St. Lucie County Republican Club (FL). Larimer County Republican Party (CO);​ Powhatan County Republican Committee (VA); Republican Party of Brazos County (TX); Snohomish County Republican Party (WA). Hawaii Republican Party; Okaloosa County Republican Party (FL). New Canaan Republican Town Committee (CT). Allen County Republican Party (OH); Williamson County Republican Party (TX). Broward Republican Executive Committee (FL); Montgomery County Republican Party (TX); Republican Party of Coryell County (TX). A number of TV news outlets failed to cover the negative health impacts of the Trump administration's decision to repeal limits on carbon dioxide pollution from coal-fired power plants. Of the major broadcast networks' morning and evening news shows, only ABC's World News Tonight mentioned how Americans' health could be affected by the move. On the major cable news networks, CNN overlooked the health angle and MSNBC addressed it in some segments, while most Fox News commentators discussed the repeal in approving or celebratory tones. Environmental Protection Agency (EPA) Administrator Scott Pruitt announced on Monday that he would formally move to repeal the Clean Power Plan, and on Tuesday he signed a proposed rule to get the process rolling. 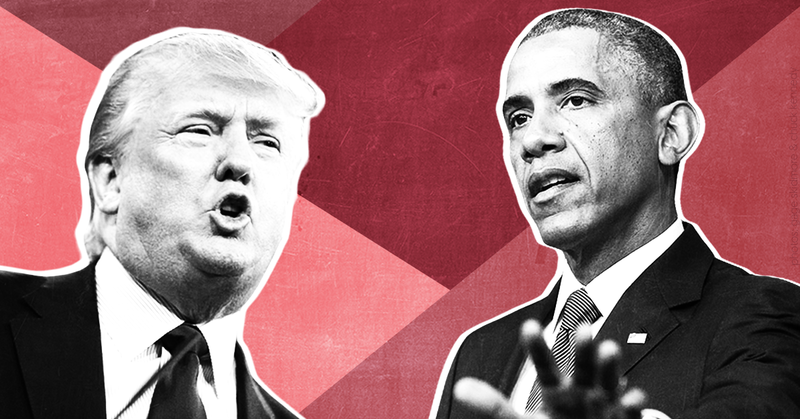 The Clean Power Plan was put in place by the Obama administration in 2015, imposing the first-ever federal limits on carbon emissions from coal-fired power plants. Under Pruitt, however, those health improvements will be denied to Americans. 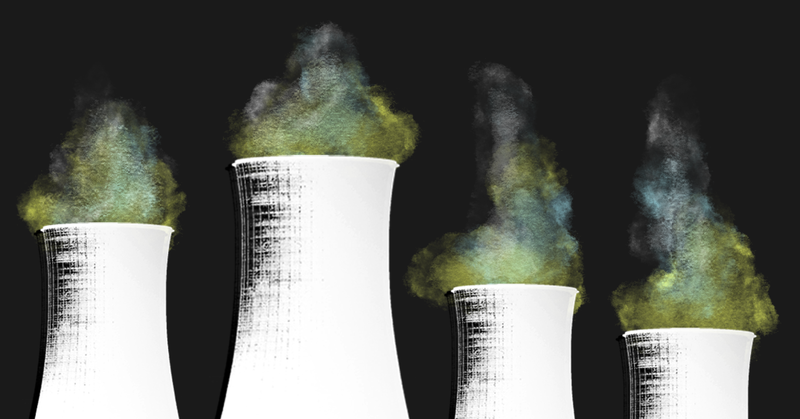 Pruitt's EPA not only disputes the scientific agreement that humans are driving climate change; it also disputes the scientific agreement that particulate matter and other smog-forming pollutants are unsafe for humans at any level. The EPA's new proposed rule contends that there would be no health benefits to reducing air pollutants below levels currently required by Clean Air Act regulations. Pruitt's repeal will be particularly harmful to people of color and low-income Americans, as they suffer more than whiter, wealthier communities do from coal plant pollution. The Clean Power Plan included a number of environmental-justice provisions intended to help redress that inequity. In contrast, neither CBS nor NBC made any reference to what the repeal would mean for public health. NBC covered the repeal once, on the October 10 episode of NBC Nightly News, while CBS covered it twice, on the October 9 episode of CBS Evening News and the October 10 episode of CBS This Morning. Of the major cable networks, MSNBC provided the best TV news coverage of the health implications of the Clean Power Plan repeal. 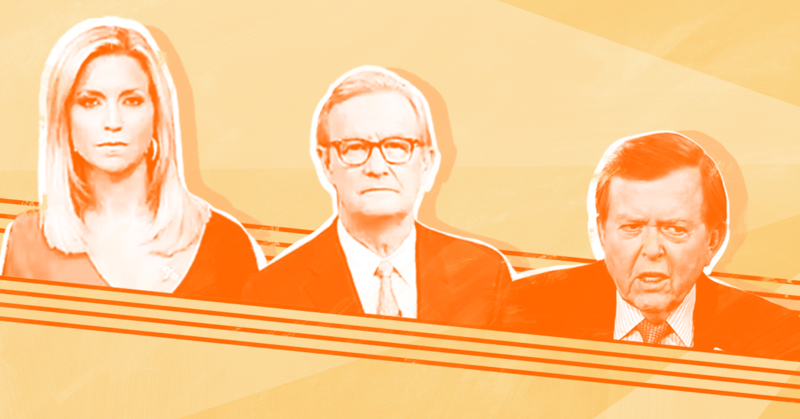 Media Matters analyzed cable news from 6 a.m. to 11 p.m. on October 9 and October 10 and found that MSNBC aired eight segments on the repeal, three of which mentioned human health. On the October 10 edition of MSNBC Live with Hallie Jackson, NBC correspondent Anne Thompson explained that “doctors are very concerned, because if you increase the amount of coal-fired power, that means you’re putting more particulates in the air, and if that happens, that means you’re going to see more asthma attacks, more days missed in school and work from various illnesses, and more premature deaths.” Another October 10 edition of MSNBC Live featured an interview with Laura Kellogg, an American Lung Association volunteer and mother of children with asthma, who discussed how the plan’s repeal would harm children living close to coal plants. And the same day on MSNBC Live with Craig Melvin, Melvin asked guest Mustafa Ali, former head of EPA's environmental justice program, about the health impacts of the repeal and gave Ali a chance to discuss the premature deaths and asthma attacks that are expected to result. CNN, on the other hand, did not discuss the health effects during any of its four segments that mentioned the Clean Power Plan repeal on October 9 and 10. Two of those segments aired on New Day on October 10, while one ran on Inside Politics on October 10 and one on At This Hour on October 9. Fox News aired seven segments covering the repeal of the Clean Power Plan and made four additional mentions while reading headlines. Much of the tone of Fox’s coverage was celebratory. Twice on the October 9 edition of Fox & Friends and once on the October 10 edition of the show, Jillian Mele presented the repeal as President Donald Trump delivering on a campaign promise to his base. On October 10, Fox & Friends co-host Brian Kilmeade introduced an interview with a former coal worker by saying, “Yesterday the Trump administration kept another campaign promise because Hillary Clinton didn't win, even though no one told her yet, to end the war on coal and help American families.” Sandra Smith also covered the repeal as Trump keeping a campaign promise on the October 9 edition of America’s Newsroom, and the next day she asked Fox contributor Karl Rove whether it can “be seen as a big win for this administration.” Rove responded, "Well, it’s a big win,” adding that Trump needed legislative victories as well. Special Report was the outlier on Fox News, citing information on health effects of the repeal in two segments. During the show’s October 9 report, correspondent Griff Jenkins read a quote from the Sierra Club noting that the Clean Power Plan would “prevent thousands of premature deaths and tens of thousands of childhood asthma attacks every year.” And on October 10, during an interview with Pruitt, host Bret Baier read a statement from former EPA Administrator Carol Browner that noted the health impacts of the move and asked Pruitt to respond to the statement. When the Obama administration finalized the Clean Power Plan in 2015, many mainstream media outlets neglected to cover the public health implications, as Media Matters noted at the time. Coverage of the Clean Power Plan was even more lacking last year. Then-candidate Trump promised to repeal the Clean Power Plan during his campaign, but broadcast news programs gave little attention to that pledge or to the plan itself last year, Media Matters found in an analysis of 2016 coverage. Ultimately, broadcast news failed to adequately inform viewers and voters before the election about what a Trump presidency would mean for environmental policy. Now we're seeing the Trump administration working to roll back more than 50 environmental protections. TV news outlets’ shortcomings this week in covering the repeal of the Clean Power Plan are just part of a longer pattern of insufficient coverage. Media Matters searched SnapStream for mentions of "Pruitt,” “Clean Power Plan," "EPA," "Environmental Protection Agency," "carbon," "emissions," "regulation,” and "rule.” We examined coverage on October 9, the day Pruitt announced his intention to repeal the rule, and October 10, the day he formally proposed the repeal. For broadcast networks, we examined the morning and evening news shows on ABC, CBS, and NBC, as well as PBS NewsHour. For cable news, we examined coverage from 6 a.m. to 11 p.m.
Zachary Pleat contributed to this report. During the presidential campaign, a cross-section of media figures argued that if Democratic presidential nominee Hillary Clinton were to win the election, she should include Republican appointees in her cabinet and other top positions in order to help unify the country. Will the media now push President-elect Donald Trump -- who said during the campaign that he wouldn’t consider offering any top positions to Democrats -- to meet that same standard? Fox's Karl Rove: Hillary Clinton Isn't "Appealing" Because "She Looks Angry, She Looks Upset"
Right-wing media are hyping a Wall Street Journal article that attempts to scandalize the FBI’s investigation into Democratic presidential nominee Hillary Clinton’s email use by tying political donations made by Clinton ally and Virginia Gov. Terry McAuliffe to a 2015 state senate candidate whose husband later became involved in the FBI investigation. Journalists mocked and poked holes in the “embarrassing” story that has “literally nothing” to it.